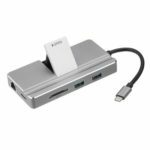 This Multiport Converter can expand USB-C port to 4K HDMI video output, 3 x USB 3.0 female ports, SD TF memory card reader, 1000 Mbps Ethernet adapter and 1 USB Type-C PD 3.0 charging port. 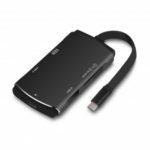 It offers a plug-and-play solution, very convenient to use and carry around. 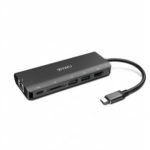 Expands USB-C port to 4K HDMI video output, 3 x USB 3.0 female ports, SD TF memory card reader, 1000 Mbps Ethernet adapter and 1 USB Type-C PD 3.0 charging port. Ideal and efficient complement for laptops. 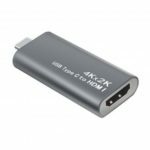 Conveniently mirror or extend your screen with USB C HDMI adapter and directly stream max 4K UHD 3840×2160 at 30Hz, Full HD 1080P or 3D video to external HDTV display, monitor or projector. It offers max speed up to 1000Mbps performance over the RJ45 Ethernet port. Faster and more reliable than most wireless connections. 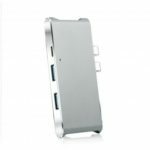 Features 3 USB 3.0 ports, allowing you to connect USB flash drive, hard drive, keyboard, mouse, printer, thumb drive, USB sticks, MP3 player etc. Built in SD and TF slots easily access files from universal SD card and Micro SD card. 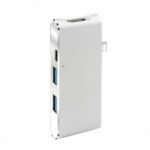 Compatible with Macbook, MateBook, ChromeBook, Lenovo, Dell which come with Type-C interface. Lightweight in design and convenient for travel and business trips.